Dive deeper into the enchantment of cinema with the Nokia 6.1 Plus. 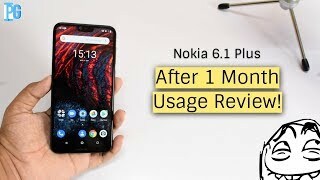 You can virtually be in a sunlit garden one minute and in jubilant Las Vegas the next, that’s how immersive the Nokia 6.1 Plus’ audio-visual experience is. Sporting an edge-to-edge Full HD+ 14.73 cm (5.8) display, that’s complemented by 2.5D curved glass, this durable smartphone will make your favorite movie-moments spring to life. You can also make the most of its cameras, thanks to the ‘Bothie’ modes’ Dual-Sight display capability that allows both the cams to work their magic at the same time. Nokia 6.1 Plus’ ‘Bothie’ mode is the new way to use your phone’s cameras to their fullest potential. This mode makes use of the Dual-Sight video capability which allows you to simultaneously use your selfie camera and rear camera so you can live stream videos directly on Facebook or YouTube, or share freshly captured images. The Dual-Sight technology splits your mobile screen to display both your cameras’ views at the same time. You can also get creative with AI filters, stickers and masks while using this feature too. 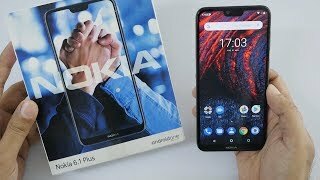 Featuring a Full HD+ 14.73 cm (5.8) display, the Nokia 6.1 Plus’s glass surface area takes up about 93% of its face. This, when coupled with an immersive 19:9 ratio, lets you enjoy stunning and lifelike visuals which bring you closer to the action. To top it off, this smartphone also features Corning Gorilla Glass, making it quite durable. You can now snap away to your heart’s desire and let your camera do all the hard work of capturing awe-inspiring pictures. The Nokia 6.1 Plus features a dual-sensor rear camera (16 MP + 5 MP), as well as a 16 MP front camera that gives you true-to-life selfies. Be it day or be it night, the time of the day does not have to be in the way of you clicking amazing pictures. Using this smartphone’s HDR Mode, you can always be camera-ready. Speedy and lag-free performance is what you get with the Nokia 6.1 Plus. Sporting a Qualcomm Snapdragon 636 processor, which is coupled with 4 GB of RAM and 64 GB of ROM, this phone makes for hassle-free, unlimited entertainment on your phone. Its internal memory is also expandable up to 400 GB, so there’s almost always space for all your favorite clips and melodies. Enjoy a pure Android experience with Android One on the Nokia 6.1 Plus. Designed by Google, Android One gives you the best of Android’s original features – a clean and easy-to-use interface, a curated set of pre-installed apps and regular security updates. This Nokia phone is equipped with a 3060 mAh battery which can give you many hours of memorable entertainment. It also comes with a USB Type-C charger that can charge your phone’s battery to up to 50% of its capacity within 30 minutes.